The Waste of Electrical and Electronic Equipment (WEEE) Regulations (SI 340 of 2005) have been put in place to recycle products using the best available recovery and recycling techniques to minimise the impact on the environment, treat any hazardous substances, avoid the increase in landfill and to increase re-use. What does this mean for Thane customers? In full compliance with the WEEE Regulations, Thane will happily take back Waste and Electronic Equipment from members of the public where equivalent replacement goods have been purchased via our website. Environmental Management costs will be applied to the retail price of new electrical and electronic goods. As Thane are based in the UK and are distance selling into the Republic of Ireland, it does not make environmental sense for us to recover WEEE back to the UK, therefore we recommend utilising the https://www.weeeireland.ie website to locate your nearest recycling point. If required Thane customers from private households in the Republic of Ireland will be able to return waste electrical and electronic equipment to Thane free of charge (except postage costs) on a one-to-one basis. This means that when purchasing an equivalent product, you can return your old version to us provided it is a like-for-like equivalent or has fulfilled the same function as the newly supplied equipment. For example, you’re entitled to send back a hairdryer, provided you purchased a new hairdryer. Items you are returning as WEEE must be returned within a maximum of 30 days from the date of delivery of the new product. The Waste Electrical and Electronic Equipment Regulations (SI 340 of 2005) (WEEE) have been put in place to ensure that products are recycled using best available treatment, recovery and recycling techniques to ensure human health and high environmental protection. 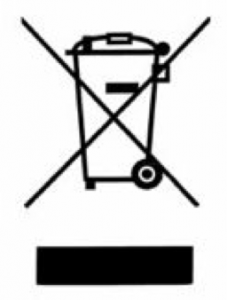 When you have finished with a WEEE product, please do not put it in your domestic waste bin, as it will not be recycled. We recommend identifying your local recycling point using the link below. Remember to always remove the batteries and deposit them in the appropriate container. Alternatively, when you purchase a replacement product, hand the old equivalent product back to the retailer. They should accept it as a requirement under the WEEE Regulations (SI 340 of 2005). In Thane’s case, as we are a distance selling retailer, we have made the facility below available for our customers, however there will be a postage cost. We highly recommend taking the product to your local recycling point and depositing it in the dedicated WEEE area as this will incur no additional costs to you the customer. All of the above options enable the product and the batteries to be treated in accordance with the WEEE Regulations (SI 340 of 2005). How to Return Waste Electrical and Electronic Equipment (WEEE) to Thane Direct UK Ltd. Thane Direct UK Ltd WEEE Registration Number is IE 01112. The address is Thane Direct UK Ltd, C/o Unit 6A, Barton Park Ind Estate, Chickenhall Lane, Eastleigh, SO50 6RR. England. The Package MUST be labelled “RECYCLING” to ensure the correct action is taken upon delivery. Waste Electrical and Electronic Equipment (WEEE) is taken back free of charge on a one-for- one, like-for-like basis. Waste batteries including rechargeable batteries are taken back free of charge. You are not obliged to make any purchase when returning old batteries. Each local authority must also accept household WEEE and small batteries free of charge at its recycling facilities. All WEEE and waste batteries must be recycled and should not be placed in any of your household wheelie bins. Make sure you always recycle all your old electrical goods and batteries. Note for Business Customers in the Republic of Ireland: this facility is for consumer customers only.